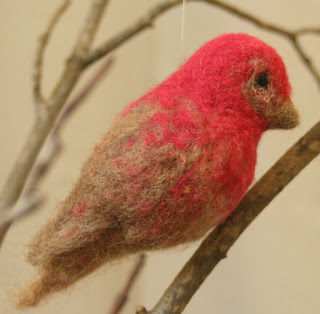 Bethany Homecrafts Upcycled Designs: Do Felted Wishes Come True? Last week I wrote that I'd not seen any purple finches or house finches this season at the feeders, and I made this one sort of as a wish that I could see some. Would you believe that only a day or two later there were some house finches in the tree out back? I'm definitely seeing and hearing a lot more birds. The season is turning, we are gaining light each day and I love the return of the birds. I've added a new show to my calendar, and I'm excited about it. It's the 20th Annual Earth Fair at the Glastonbury Audubon Society on April 25. I've added a link to it on my links list. I'll love being there, as it is so much about green living, how we can make changes in our daily habits that will help this earth of ours. And a great place to bring my birds!